Anne Kania has been a classical opera singer, an IT project manager and a partner in an environmental services company in a career spanning three continents and as many decades. 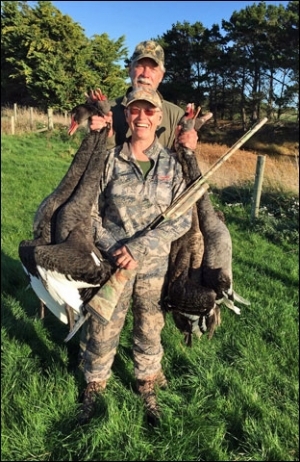 Today, as owner of Joy of Hunting, she devotes her energy to encouraging women to become skilled wingshooters, whether they are starting out or need a helping hand to gain more confidence. Anne, her husband Bruce and their three Labrador Retrievers live near Billings, Montana where they hunt seven months of the year. You can visit the Joy of Hunting web site at http://www.joyofhunting.com. There’s no shortage of self-help books, blogs and TV shows on how to maintain a successful marriage. They often dispense predictable suggestions such as romantic getaways, better communications and compromise. While those tactics are certainly useful, my friend Paula Formosa and I have discovered that hunting with your significant other strengthens personal bonds in ways that are more meaningful and longer lasting than a dip in a heart-shaped Jacuzzi.